Auction.com Reviews - Is it a Scam or Legit? 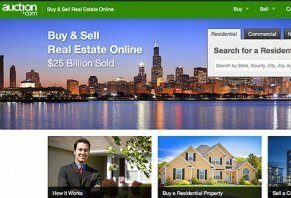 Auction.com claims to be the “nation’s leading online real estate marketplace” to purchase residential and commercial properties using an auction format. If you’re looking to purchase a new property, you may have heard about Auction.com, which claims to allow you to buy and sell residential and commercial property in an online auction format. In fact, Auction.com claims to have sold more than $25 billion of residential and commercial real estate since opening its doors in 2007. But when it comes down to it, can Auction.com really help you find your next real estate purchase, or is it just a way to scam you out of your hard-earned money? We sifted through the facts, and here’s what we found out. At its most basic, Auction.com claims to be a real estate marketplace that uses “world-class marketing and cutting-edge technology” to help bring buyers and sellers together in an easy to use format. All Auction.com real estate auctions—including bank owned and redemption properties, foreclosures, short sales, bankruptcies, bulk sales, and residential and commercial notes—are date and time-specific, so you’ll always know exactly when they’ll begin and end. In fact, in some instances, Auction.com claims that some of their properties may be newly available and not listed anywhere else. Search for properties that meet your criteria, including by state, county, city, zip code, address, or property ID, and then save them as your favorites. You can also sign up to receive email alerts any time a new property that matches your criteria is listed. Once you’re ready, you can then register for the property’s auction, place your deposit, and begin bidding. Bids are placed directly through the Auction.com website, and you can bid on more than one property at a time. However, you may be required to contact a bidder qualification representative, submit additional documents, and/or provide proof of funds prior to placing your bid. Auction.com also offers the ability to practice bidding before going through a live auction. If you end up being the high bidder, you’ll pay for the property and begin closing (we’ll talk more about this in the Bottom Line section). During an Auction.com auction, the property’s home page will include important details such as type, address, square footage, number of bedrooms and bathrooms, estimated amount owed by the current owner, and pictures, as well as current bid, bid deposit, time remaining, if financing is available, and whether or not the reserve has been met. With this in mind, while most residential auctions occur directly through the Auction.com website, some foreclosure auctions will take place live at public venues (e.g. courthouses). If you’re looking for properties on the go, Auction.com also offers an iPhone app. Signing up for Auction.com is free of charge, which gives you the ability to save searches, create custom alerts, and to receive auction announcements and advance notifications for new auctions that you may be interested in. However, once you’ve decided to start bidding on a residential property auction, you’ll be required to put down a deposit of anywhere between $1,000 and $2,500, which must be placed on a credit card. On top of this if you’re the winning bidder, you may be required to pay a buyer’s premium in addition to the final purchase price, which is typically 5%. For example, if you purchase a home for $100,000, you may be required to pay an additional $5,000 directly to the seller on top of the sales price, which in most instances is a bank. If you’re the winning bidder once the auction has concluded, your credit card deposit will be returned after earnest money has been received and purchase documentation has been signed. However, if you’re not the winning bidder, your deposit will be returned to your card within 2 business days. It appears that there are no refunds associated with use of Auction.com, which seems to weigh heavily in the seller’s favor. We’ll talk more about this in the Bottom Line section. Other Auction.com Reviews Around the Web? Numerous seller’s fees (often initiated by the banks) on top of the winning bid, many of which were not disclosed in the original auction. Homes are already overpriced before auctioning even begins. Accusations that these homes are not salable on the open market due to very poor condition (e.g. presence of mold/termites, serious structural problems, etc.). In fact, we read several reviews claiming that even when documentation for problems such as these were provided to Auction.com, they refused to list them in the property’s auction. Poor customer (rude, unhelpful, attempt to rush you into signing an agreement that essentially waives all your rights as a seller). What’s the Bottom Line About Auction.com? First and foremost, keep in mind that you’re solely responsible for performing all due diligence on any property you’re thinking about purchasing through Auction.com, including any existing liens and hazardous conditions. On top of this, most properties are not contingent upon financing and are sold “as is/where is” with no other contingencies available (such as an inspection). In other words, it’s up to you to find out as much as you can about a property before bidding, and if something comes up after you’ve agreed to purchase it, you have no recourse against the seller. Finally, although Auction.com holds an A+ rating with the Better Business Bureau with just 12 closed complaints over the past three years, their online reputation is much less rosy. In addition to the complaints noted in the previous section, the company has a reputation for rushing buyers to sign contracts that essentially strip you of any rights you may have. Bottom line: If you decide to purchase a residential or commercial property through Auction.com, it appears it’s pretty much a coin toss as to whether or not your high bid will be accepted by the bank. And if it is, remember that you’ll essentially be subject to whatever last-minute changes the bank decides to make, while having almost no recourse throughout the process. Seems like a bunch of scammers. I've registered to bid a few properties - they have hidden reserves and auto-bid against you. Then I traveled 250 miles to check out a property on the 9th of March that I was going to bid - and then find out they show it as sale pending when Auction was supposed to be on the 11th-13th of March. Why do they not inform registered bidders? Are they just a bunch of crooks - appears so. Buyer beware, plus, there are loads on most transactions. Hi Gregory. Thank you for your review. We are sorry to hear you did not have a great experience. Would you like to take this conversation offline so I can look into this property for you? If so, please send an email to connect@auction.com. I could write a very long complaint about Auction.com, there were so many things that went wrong but let me just cut this short. The auction process was not bad. We had a good look at the property before Aucton.com got involved and we knew what we were willing to pay. So at the near close of the auction, we began to bit. We were the only bidder and were led to the reserve price, which was about half the tax value. We won! Within minutes we were contacted and asked to file out some online paperwork and basically told we really needed to use their escrow company. We were told we would get free title insurance if we did, so that is what we did. That was the Big Mistake. Too many problems to even go over on here. We had our own local attorney review everything and were happy we did. Bottom line, don't use their escrow company for closing, just get someone local to handle the closing and pay the coordination fee. Oh, and that free title insurance, they tried to say they never offered it, but we held them to it. Even after we had paid for the house, it took them a week to send us the code to the lock box to get in, and the code was still wrong. The final straw was it took about six weeks to get the deed. Yes, get you a deal at Auction.com, but get your own closing attorney. Hi Robert. Thank you for your review. We are glad you were able to win the property, but we are sorry to hear you had difficulties at closing. Reviews like yours help us to learn and improve. If you would like to share more, please send us an email to connect@auction.com. My home is listed as a foreclosure on your site. It is not in foreclosure. I have endured people stopping, picture taking, realtors sending me info on their companies. I find this company hard to deal with I would never recommend them to anyone. I just want my home removed and they are not capable of doing this. Negative rating from me. Hi Bonnie. Would you like to take this conversation to email so I can look into this for you? If you would like to connect, please email us at connect@auction.com. Please reference this conversation. Thank you. It’s not worth it...my first experience. I used an auction to purchase a home eight years ago. The auction was in person and I experienced what I have now learned to be, shill bidding. The home I was bidding on was in fair condition and back then we were going through a recession so you could get a brand new foreclosed home for $99k. I went to the auction hoping to get a good deal, but once the bid went over $80k, I decided it was too much and let it go. While leaving out, I was approached by an Auction.com rep and told if I wanted the house, I could have it for the $75k I bid. Without question, I purchased the home and within the first few months I found out so much was wrong with the home. I ended up putting over $40k into the home, renovating kitchen, three bathrooms, all new flooring, siding, and two brand new AC units because both went out within the first month. I walked away a few years later with nothing because I ran out of funding to fix everything in the home. The foundation needed repair, a new roof and so much more. This was my first time using Auction.com so I learned to do my homework and FACTOR IN EVERYTHING that looks like a possible. This home was a foreclosure so my belief is the banks don’t care about the condition of the home, they only want the money the borrower owes them, and it’s Auction.com's job to do their best to get it to them. REMEMBER, Auction.com works for the seller, not in the interest of the buyer. I’m sure they will deny shill bidding took place since it’s illegal, but why would the winning bidder suddenly disappear? I hadn’t even walked 5 feet from my seat when I was approached and told I could have the property. Auction.com in contempt of court? I am presently in a Chapter 13 Bankruptcy in Federal Court since May of 2016 and Auction.Com keeps publishing that my home is up for auction every month. My wife, children, and 80-year-old parents have had enough and contacted Americans Against Foreclosures (AAF). They have now filed an Order to Show Cause (OSC) why Auction.Com should not be held in contempt of court for violating the Automatic Stay in the Bankruptcy. We continually get collection calls, realtors and brokers coming buy, people outside taking pictures and trespassing on our property all due to the published content on Auction.Com. This should be made illegal in all States in the US immediately. My husband and I found a house on Auction.com in May. The bidding started, and before the auction was supposed to be over, the auction was canceled. Then fast forward to December, the same house went back up on auction. It started on 12/19 and we placed a bid. The auction was not supposed to end until 12/26. On 12/21, the auction was canceled. And then by our surprise, it went back up as an active auction. We then placed another bid, and we went back and forth and were the highest bidder at 9:30 am on 12/26 and the auction was supposed to end on 12/26 at 10:26 am. We were excited and kept looking and then at 10:01 am the auction was canceled, AGAIN! I don’t understand how this could have happened...twice! I don’t even know if this is a house that is in still actually in foreclosure. It seems pretty sketchy. Bottom line is, I would not recommend, and we had a horrible experience, not once, but twice. Hi Amy. Thank you for your review. Auction.com provides marketing services for trustee and foreclosure firms and advertises the times and dates where the foreclosure sale will occur. In the event that a defaulting borrower resolves their loan, Auction.com is notified by the foreclosure/trustee to remove these advertisements. Cancellation of a property auction may be due to a mutual agreement, bankruptcy, beneficiary's request, trustee's discretion, or operation of law for example. Please let us know if you have questions. I am having a hard time making a bid. Hi Mark. Please send us a message to connect@auction.com and we will be happy to help. I won a bid on a house back in August 2018 only to find out months later that they gave FALSE INFORMATION (it was advertised as REO, meaning real estate owned). How is selling a house that isn't even YOURS YET legal?! Because of this misrepresentation, it took 3 months for them to get their information together for closing only to find out that they were trying to sell the house for MUCH MORE than what was owed on the property in the first place! Information that would have been NICE TO KNOW THREE MONTHS AGO when we were originally supposed to close! Only an idiot is going to sign themselves up to potentially lose thousands of dollars if the house is redeemed during the 6-month redemption period, which can often times happen! BUT WAIT, it gets WORSE. After all of the misrepresentation and lies, they threaten to keep the earnest money deposit of over $8k. On top of that, I see the house listed on Auction.com right now to be sold again, HAHAHAHA. And would you believe they are still hoarding our $8k earnest money deposit?! SCAMMERS. BEWARE. Also, if you are reading this and the same thing is happening to you, don't go down without a fight. I am hoping to take them to court. Best of luck Auction.com! Hi Lexi. Would you mind sending us an email to connect@auction.com with the property address and the buyer's email address so I can look into this for you? Did you file a complaint against them? This auctioned was scheduled for 9 am. I arrived at 845 and registered. There were several Auction.com employees present. I asked whether this auction was on or postponed, but they could not answer. In fact, I wasted several hours waiting for an answer. I did get an email at 1:12 stating the auction was postponed. 1. The employee who read the usual legalese at 9 am mumbled and could barely read English. His discussion was barely understandable. Look into it and improve the presentation. 2. I have been to many foreclosure sales not run by Auction.com. You show up at the sale time and you are told immediately whether the sale is on or postponed. Auction.com wastes the buyer's time. The excuse offered was "poor homeowner, give him a chance." The homeowner had almost 4 months to cure his default. 3. I have purchased more than 5 properties through auction.com - several million dollars. In each sale, my treatment by Auction.com was a 3 on a scale of 1-10. Besides the typical incompetence of Auction.com, I absolutely object to your policy of allowing the seller in online auctions to bid up the price. It is unethical, and it is no longer an auction. In reviews of Auction.com, many others have objected to this policy. Because of this policy, I have not purchased any of your properties in the last few years. 4. Your disregard for your clients, the buyers, have lost you my business. Without satisfied buyers, your sellers will go elsewhere, and your business is finished. Everything looked fine and the owner was very behind on payments. This company is a JOKE. You can’t get ahold of anyone, LITERALLY, the auctioneers and reps know NOTHING. Buy from them or just light your money on fire, more satisfaction watching it burn than dealing with these people. I've been flipping houses for the past 30 years and this is the first time I'm attempting to purchase a property from Auction.com, and I assure you it will be the last. I won a bid on a property through Auction.com approximately 5 weeks ago. I was informed that closing was set for the 29th of October. By the 20th of October, I started making numerous calls and emails to Auction.com as well as their recommended title company, which by the way are extremely rude. I was told that the only thing they're waiting for to close is the township inspection for the final CO (smoke cert). By the 25th I took it upon myself to go to the township to see if the inspection was done. I was informed that the inspection was paid for but never ordered or scheduled. The township inspector was kind enough to call Rosie from Auction.com at 818-906-9738 to inform her that the buyer here and closing is set for the 29th, and at that point, she scheduled it for the 26th, the following day at 1 pm, and she would have one of the representatives there to let him in. I made a point to be present during the inspection and all went well and passed. The CO (smoke cert) was emailed to all parties involved to ensure that we could still close on the 29th. Immediately afterward, I called Auction.com, as well as the recommended title agency, informed them that we're all good and ready to go and we got the proper paperwork, and I took it upon myself to make sure it gets done and we can close on Monday the 29th. That evening, I got an email from PennyMac requesting for me to sign a 15-day extension. I immediately emailed her back to inform her of the update and her lack of communication and the extension will be denied since I took it upon myself to do their work and I have other prior arrangements and I will not be in town. That fell on deaf ears, and she emailed me two more times with the same request. It is now Sunday the 28th of October, and we're supposed to close tomorrow the 29th of October. Auction.com is an online marketing and auction platform for assets in all stages of the foreclosure lifecycle. These assets are each unique and may be participating in government programs making them eligible to participate in the auction process. Due to the unique nature of these assets, there may be additional tasks and requirements to be fulfilled prior to closing than one may typically see in a standard traditional sale. We have checked our records, and it appears that Rosie is an employee for the third-party property management company and was responsible for coordinating the required smoke detector point of sale inspection. Additionally, we show that the agreed-upon terms in the Purchase and Sale Agreement put the agreed upon closing date as October 25, 2018. Due to the dates, an extension was requested to ensure all required documents would be on file prior to the file funding. We show that the transaction actually closed on October 31, 2018, and the seller is still in need of the executed extension document in order for the file to be complete. We would be happy to discuss this further and address any questions or concerns. Quite obvious, for my original post, the issue was not the smoke cert as I previously said, I took care of that on the 26th of October closing is set for the 29th of October. I called the title company of your recommendation (LINEAR) on the 29th of October to get the wire transfer information, and I was told by Nicole they can't close because they never contacted the homeowners association to get the figures and they need an extension till November 15th. Once in, I took it upon myself to give them the contact information as well as me contacting the homeowners association. You would think the problem is solved but not with that title company. Couple hours later I called the title company and was informed that the seller paid the quarterly taxes and was not posted on the township site yet. I suggested that hold the money in escrow and let's move forward with closing. Closing still did not happen on 29th. I got a call from Rosa on the 31st of October, that the title company can close today if I were to sign an extension for just one day, I COMPLIED. But if I'm not mistaken, they were saying an extension was never assigned and your file is not complete yet, how do you close on a property with avoiding the contract, that clearly states time of the essence do you research auction.com and stop sugar coating the issue learn from it and move forward. Not the best way to buy a house! I have purchased a few houses from Auction.com. I have been a successful "house flipper" for many years now. It doesn't matter what the starting bid price is because it's not selling for that. First check online or with a Realtor to see what the listed price is. I have found the reserve with Auction.com is usually around 5-8% less than that amount, but by the time you pay your auction fees and stuff, it works out to be pretty close to the same. You NEED TO KNOW this amount because that is the price where you actually have a chance to purchase the home. Auction.com will AUTO BID the price up repeatedly to get the house up to the reserve amount, so they have a chance to close the deal! I constantly bid on a house and was outbid every time within 20 minutes. I waited for the same house to come back on "auction" since it didn't sell or meet the reserve numerous times, and I learned it would be back on in one week, pretty much every Sunday and would end on Wednesday. I seriously watched the same property 10 times, and as I write this, I am waiting for the next round, hoping the reserve will be just a fuzz lower because I really want it! But what I did was wait once, I waited for 2 days, and there were NO BIDS, so I bid at 1 am and yup, I was outbid by 1:30 am. This just confirmed to me that I was bidding against a computer. Don't get me wrong, Auction.com will sell you a house, but you just won't get that smoking deal that you think you're going to. Be smart, and educate yourself on the property and what it's worth, and know your limits, AND STICK TO THEM! That's the hardest part. Especially with their auto bidding computer. They will make you think, "hmmm...it's only $1k more...I can do that." HA! Later you win and go over your budget by $10k. Like I said in the beginning, I HAVE PURCHASED a couple of houses from Auction.com and actually closed the deals. I have also lost hundreds of auctions as well, and I am perfectly fine with that! Hi James. Thank you for your review. We would like to hear more about the property you are tracking. Would you mind taking this conversation to email? You can reach us directly at connect@auction.com. I’m going through a similar situation. Yes they have robots driving up the cost, the home does not sell and it’s right back on a few days later. I actually bid on one just to see if they were passing up real human bids, and sure enough, the computer outbid me and the property was relisted the next week. The sad part is the property true value is closer to the opening price, not the estimated market value. I’m going to post my experience with them below. Hi Jane. Thank you for your comment. As disclosed in the Auction.com Participation Terms and property details page, Auction.com is permitted to bid on behalf of the seller up to, but shall not exceed the reserve price. Counter bidding on behalf of the seller extends the auction for assets that have not reached the reserve price and would otherwise end unsuccessfully. By extending the auction, it increases the likelihood that the auction may end successfully. This practice benefits the bidder by increasing the likelihood that the auction will produce an offer that the lender is willing to accept. Please let us know if you have any questions. You can reach us directly at connect@auction.com. It's not really an auction as you are bidding against their own site's computer. It automatically bids up and adds time at the end of the auction even if you are the only one bidding so as to get their reserve price. Why don't they just tell the minimum price needed than having the "auction" over and over until their price is met? Thank you for your comment, but please allow us to clarify your comments as they are not entirely accurate. As disclosed in the Auction.com participation terms and property details page, Auction.com is permitted to bid on behalf of the seller up to, but shall not exceed the reserve price. Counter bidding on behalf of the seller extends the auction for assets that have not reached the reserve price and would otherwise end unsuccessfully. By extending the auction, it increases the likelihood that the auction may end successfully. This practice benefits the bidder by increasing the likelihood that the auction will produce an offer that the lender is willing to accept. Please let us know if you have questions. It is a scam. Do not fall for their false claim solicitation via email that the highest bidder will win the property end of the auction period. I have been declared to be the winner and won a real estate in question surpass the set reserve price. I had asked to sign electronically their "Purchase and Sale Agreement With Joint Closing Instruction" documents after Auction.com instructed me to wire transfer the earnest money to a bank account. Despite the written documentation, which states that the signing of the purchase agreement is simultaneous. I was told it takes 7-12 days before Auction.com can provide me with a legal document copy bearing the seller's signature marked the proper boxes so that the closing and an escrow account could establish before the 30 days (transaction being financed 45 calendar days) closing date set. I had never received the signed and the corrected documents but I received an email notification that they have received my cancellation request of the pending purchase. As of 60 days later, I am out of $10,825.00 earnest money paid. No explanation. Be aware of doing any business or participate the fake process bidding with Auction.com or its parent Ten-X LLC companies ever. Hi Frank. Thank you for your comment. Would you mind sharing the property address so we can look into this? Write a Review for Auction.com!